Australian urban councils typically have set a number of guidelines and rules that one must follow when paving surfaces to comply with their building laws. Homeowners are familiar with these apply to driveways, gardens, extensions and other paved areas. 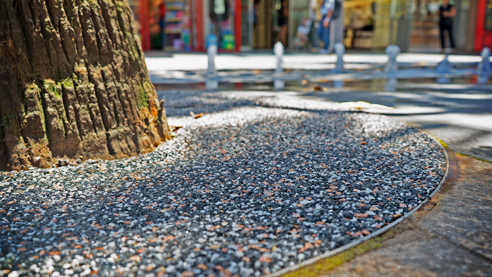 They are particularly relevant to hardscaping public areas, including tree surrounds. Typically found on pathways, on roadsides, in cities, and shopping areas. Because councils recognise the environmental and social benefits of trees in these spaces, they are found on nearly every city shopping street. Having various options available for creating tree surrounds, Councils need to factor in lognevity, appearance, safety, cost and porosity. Natural stone has many of these advantages and no other surface is as comprehensively effective for tree surrounds than StoneSet, which we have explained in the past post on tree surrounds here. For homeowners, you can get the advantages of tree surrounds as well! We recommend to contract a professional construction company that will help you to meet council requirement. StoneSet is always available to guide and help you with all paving aspects and requirements.